FMC: When did you start playing basketball and what drew you to the sport? I started playing at an early age and started playing competitively around 15. I loved the competitive nature and the potential opportunities it could provide. Growing up, you were always taught to be nice with all the other kids but on the basketball court, nothing was off limits. I loved being able to compete with all the other kids and use my size without getting in trouble. Over the years the way I see basketball has really changed. It has gone from a hobby to almost a business in some sense. However the one thing that stayed consistent over the years is my love to compete. FMC: You come from a basketball crazed family, with your brother being a former NBL player and your dad a current coach in the NBL. What sort of influence has that had on your game, do you see yourself at an advantage having such a family? It really drove me, it gave me the opportunity which most players never get, i got to learn how a professional basketball player takes care of his business on and off the court. I learnt that you can’t just turn up to practice 5 minutes before it started, leave after it ends, and expect to be good. The biggest benefit from living with my family is that basketball never stops. We go to practice then come home and either watch or talk about basketball all night. This really helped me understand the ins and outs of the game and increased my basketball IQ. I am hoping that in the future I can continue to take advantage of having a family that supports me as mine have done. FMC: 1 on 1 vs your brother Dom (former NBL Player), first to 11 who’s coming out on top? Not even close anymore. He would struggle to score over my size/length and I would have a mismatch in all facets of the game. I would be able to shoot over him, post him up whilst blocking all of his shots. 11-2… No contest. FMC: What has been the highlight of your basketball career so far? Being able to wear my country's name on the front of my jersey while repping “Cooks” on the back. Going to China with the emerging Boomers team was undoubtedly the highlight of my basketball career. FMC: What has been the toughest thing you've gone through as a player? Was it an injury, being cut from a team when you were younger, maybe a goal that took you longer to reach than you wanted? My toughest time in basketball was when I was like 16/17. I had really developed my game and felt like I wasn't getting the recognition i deserved. All my friends who played basketball were getting recruited by many colleges and drawing attention from the national programs while i felt like i was just as good as them and had zero interest from colleges. High School was coming to an end and I knew I had to decide whether i was going to pursue this basketball thing or move on to the next chapter of my life. I know this doesn’t sound tough or difficult but I really took pride in my basketball ability and I began to doubt myself. FMC: What was your thought process after that failure, that allowed you to keep playing and further your career to the point you are at now? My family. They kept feeding me confidence and told me that I had no control over that stuff and that all I could do was keep working hard and the results will take care of themselves. FMC: Give us an insight to college basketball life? Are the practices as tough as everyone says? Line sprints galore, morning and evening sessions. Is it really that full on? College is everything that I thought it was going to be. The pre seasons are hell!! They run us into the floor at 6am every morning then expect us to come back at night time to work out. In season, we come to the basketball stadium everyday for roughly 3.5 hours a day. We have weight lifting every second day which normally last an hour, following that we usually go into the theatre room and watch video from practice the day before. This usually last about 15 minutes then we go onto the court. It depends on coach’s mood, but most days last a bit over 2 hours. Some days are harder than others, and some days you just want to quit. But the thing that keeps us going is our love for the game. FMC: In your career so far who has been the toughest player you have ever had to guard both domestically or at the college level? For us at who sit on the couch can you provide us an insight on why these people are so tough to guard? Is it athleticism, Bball IQ, or are they just that skilled? Dante Exum was the hardest player i have had to guard. His length combined with his lightning speed makes him a mismatch for everyone. He’s too tall to defend with a guard and too fast for a forward to guard him. In addition to his physical attributes, he also has an excellent feel for the game. When I played him he didn’t try to force anything and only took what the game gave him. FMC: Who you got in your top 5? MJ, Lebron, Kobe, Shaq, A.I. FMC: Who is or was (if they're not playing anymore) your favourite player to watch? A.I!! I love how he played with so much character and so much swag. He played the game the way he wanted and did not care what everyone else thought. FMC: So often we here about the players and their achievements but often not about those behind them. Have you had any particular coaches or role models whose words or actions have stuck with you as a player and as a person? My family, by far, has been the biggest support and influence on me. I still remember all the times we would play in the back yard and the lessons they taught me back then. FMC: What are your goals for the rest of the NCAA season? Win the conference championship and proceed to the NCAA tournament. FMC: Where do you see yourself at the end of your college career? NBA? Euroleague? NBL? I would love the opportunity to play somewhere in Europe. FMC: For all the younger kids aspiring to make college basketball and represent their country do you have any words of advice? Keep working hard!! There is no cheat code to basketball. 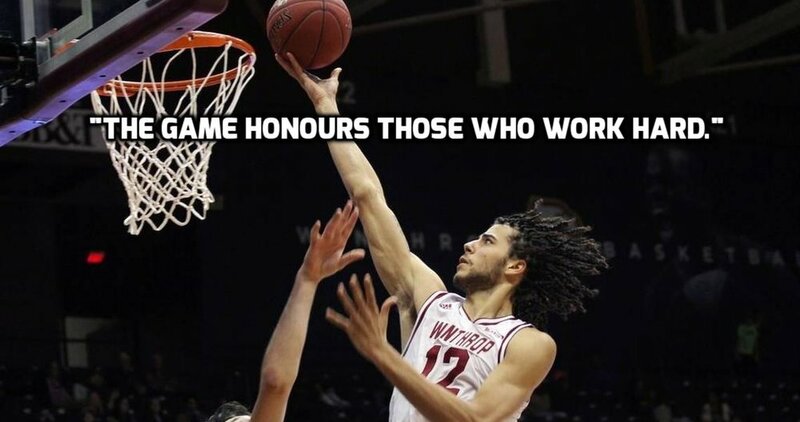 The game honours those who work hard.